intend to submit a 2015 R&D Claim. Over the next few months, AusIndustry will likely start compliance activity for FY14 applications that were lodged around the April 30 deadline. the claimed activities were in accordance with the R&D Tax legislation. Where a company incurs R&D expenditure from an associate during a year, the expenditure must be paid prior to the end of the financial year to be claimed as an R&D Tax Offset in that year. For example, a consulting fee or wage charged by a controlling director for R&D Services would be subject to the associate entity payment provisions. Likewise, any charges from associate business entities for R&D Services would also be subject to the associate entity payment provisions. Where a company incurs R&D expenditure from associates that is not paid by the end of the financial year, the company is able to carry forward the amount and claim as R&D expenditure in subsequent years when the item is paid. An Overseas Finding is a binding decision that relates to overseas activities and expenditure. There are specific rules surrounding the inclusion of overseas expenditure within a company’s Australian R&D Tax Incentive claim. A company must seek approval to claim the overseas expenditure by lodging an Overseas Finding application before the end of the financial year. On 17 June 2015 the Tax and Superannuation Laws Amendment (2015 Measures No 3) Bill 2015 passed the House of Representatives and now enters the upper house for the consideration by the senate. The Bill will amend the ITAA 1997 to reduce the rates of the tax offset available under the research and development tax incentive for the first $100 million of R&D expenditure by 1.5%. The higher (refundable) rate of the tax offset will be reduced from 45% to 43.5% and the lower (non-refundable) rates of the tax offset will be reduced from 40% to 38.5%. This measure applies to income years starting on or after 1 July 2014. Swanson Reed acknowledges the need for budget repair and supports the recently introduced $100 million cap on R&D Expenditure. We are however strongly opposed to the 1.5% R&D Offset Rate reduction since the uniform reduction to the company tax rate on which the change was based now will only apply to very small companies. We call for the 1.5% R&D Offset rate reduction to be reconsidered and that a commitment to stable innovation policy be prioritized. 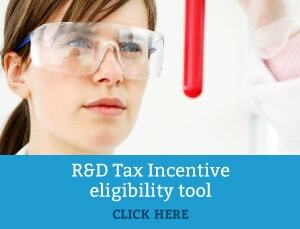 Are you Eligible to claim the R&D Tax Incentive? Check out our Eligibility Wizard to find out.